City lights and thermal radiation create an abstract, russet shape that's barely recognizable as metropolitan Southern California. Black voids dominate the frame; many of these are hills and mountain ranges, but the emptiness at the bottom of the photo is the Pacific Ocean. We can see how, as the city grew, it spilled around natural barriers to fill inland valleys and the vast coastal plain. Virtually all the flat land in cismontane Southern California has been urbanized for decades. We also notice a clear break between the metropolitan sprawl of Los Angeles (center-left) and San Diego, which floats like an island in the bottom-right of the frame. That dark area separating the two is Marine Corps Base Camp Pendleton. Without it, the two metropolises might already be one. A crew member aboard the International Space Station captured the photograph on Christmas Eve, 2011. 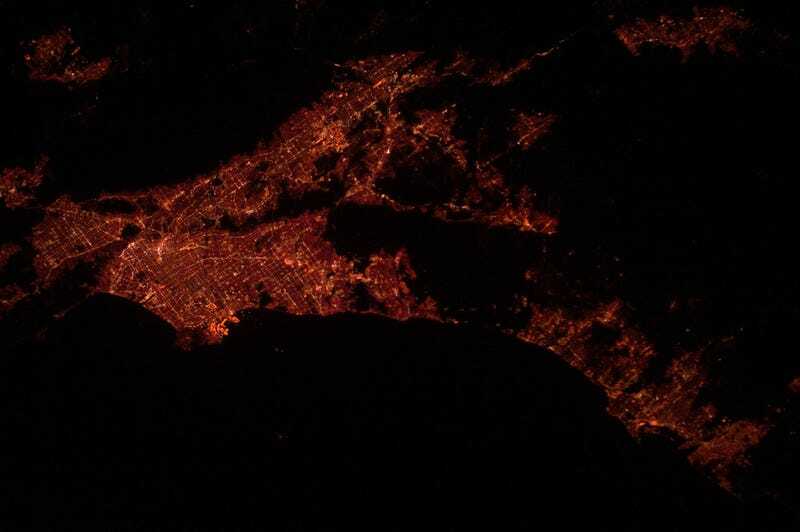 A similar image below, taken the same night over the San Francisco Bay Area, is even more disorienting.